Clouds Over the Prairie looks at Colorado’s grassland species, and what can be done to help preserve this vanishing ecosystem. Colorado’s nocturnal wildlife is featured in Creatures of the Night. Some of Colorado’s largest wildlife species are profiled in Bears and Moose on the Loose. SENSEsational is about the amazing ways animals use their senses. Did you ever wonder how animals survive the cold? See Small Mammals in Winter. Find out some amazing facts about hummingbirds – and how you can attract them to your yard – in Summer’s Hummers. Colorado has various kinds of ecosystems, including alpine tundra, which is found in places like Mt. Evans. Learn more in Summertime Reveals Secrets of the Alpine Tundra. Learn how you can help protect Colorado’s wildlife species in Teaming with Wildlife. Have you spotted an interesting animal in your neighborhood? Check out Urban Wildlife. 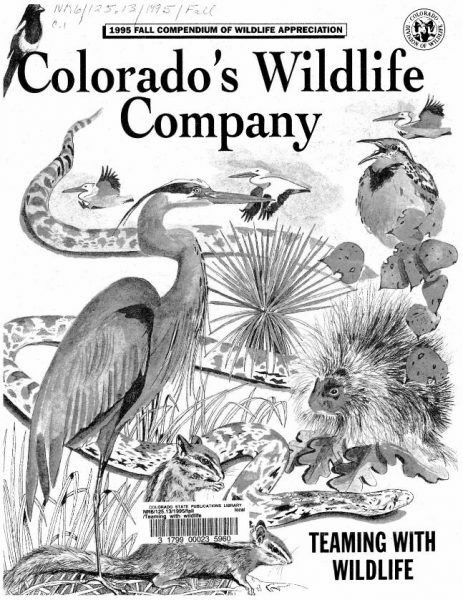 Finally, in Spring 1999, Colorado’s Wildlife Company celebrated its 10th anniversary with a special issue looking back on some of the favorite stories of the past ten years. Which are your favorites? You can find a directory of issues on Colorado Parks & Wildlife’s website; then head over to our library’s online catalog to search for the issue you’d like to see. All issues are also available for checkout in print.